Washington (CNN) – The Republicans' latest weekly address makes no mention of the government funding bill whose passage they spent recent weeks tying to an effort to defund Obamacare. Instead, the focus is now on the debt limit. In Saturday's address, Rep. Cathy McMorris Rodgers, the GOP conference chairwoman, calls the debt limit debate “a golden opportunity to fix the problems coming out of Washington." According to Rodgers, Americans overwhelmingly want the bill that would authorize the Treasury Department to raise its borrowing limit to come with “solutions that help solve our debt and grow our economy." That means a host of GOP priorities like approving the Keystone XL pipeline, updating the tax code and delaying the Affordable Care Act. Rogers was deeply critical of President Barack Obama’s refusal to negotiate over the debt limit. Obama has said that raising the limit to ensure the country can pay for spending that Congress already authorized is Congress' responsibility. The debt limit has been tied to efforts to alter spending before, Rogers said, arguing that presidents Ronald Reagan, George H.W. Bush, Bill Clinton and even Obama himself in 2011 negotiated over the debt limit. It was the 2011 debt limit deal that created the automatic budget cuts known as the sequester. “To reiterate, every major deficit reduction effort of the last 30 years has been tied to the debt limit. This time should be no different," she said. Republicans can only ruin our nation's credit once. After October 17th, what leverage do they have? Teatards are blackmailing domestic terrorists. Put them all in jail. They are criminals of the worst kind. Many could die without healthcare. The same healthcare they get from our taxpayers money. It's sort of like Animal Farm. All animals are equal but some animals in congress and their rich friends are more worthy those with no health insurance end up at the glue factory. 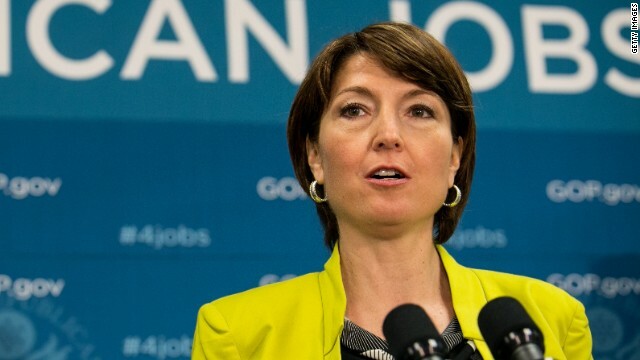 I like the way the spineless GOP boys hand the ball over to Rep. Cathy McMorris Rodgers . Has anybody looked into her environmental policy ? She is an elected lobbyist ! Rep. Cathy McMorris Rodgers- this week's mouth piece for the terrorist and extortion party. They have done more harm to this country than Al Queda could have ever hoped to do. The republican party, however divided is still a terrorist organisation. Why you ask? Because they themselves do not have a leader, and are bending to the will of extremist within their own ranks. The rest of us are being held hostage to the constant rants that if they don't get what they want, they'll do all they can to destroy whats now in place. If these people were to be dealt with as outside forces, no one, and I mean no one would negotiate with them, or acknowledge their existence. If they get voted back in, in 2014, the people are either completely stark staring nuts, or the elections have been fixed in their perspective areas. It's obvious to the American people that Republicans are holding the debt limit hostage to a long list of demands that have little or nothing to do with the debt. If they want to reduce spending there are many ways to do this, but building the final phase of the Keystone Pipeline so the Koch Brothers can pick up an extra $2 Billion by refining oil and shipping it out of the Gulf does nothing to reduce debt. This is all about a "payoff" for wealthy Republican donors, not about reducing debt. Great, the gop doesn't want to pay for the bills they racked up for wars and costly defense contractors. The want to take down America with them. THANK GOD we have a President that won't let that happen. I think this situation shows that we all better wise up and start voting against incumbency. It is destroying our system of government – by returning these people year after year and entrusting them with the welfare of this nation we are destroying any future for our children and grandchildren. Benjamin Franklin said the US Constitution would be the second greatest document ever written other than the Scriptures, but ultimately it would fail because of the corruptness of the people and when the people become totally corrupt – we will turn to despots because only despots can govern the corrupt. He was talking about the people we elect to office under the system of government he was proposing. He knew this – and used this argument to get term limits written into the constitution, as a solution to the corruption he knew was to come. What he did not for see was the media's power and ability to keep these people in office – people they know that are easily corrupted – (thus the constant reference to "unnamed sources" we always see). Vote against incumbency and help save a nation and a constitution that was founded and written by God fearing people. The Republicans have found a way to promote their agenda without actually having to become the majority party. If they can use their appropriations power and the need to increase the debt ceiling as hostages, the consequences for the American economy are so dire that the country will accede to their demands. If they can prevent health care reform with the threat of shutting down the government, just think of the ransom they could get over the debt ceiling increase. How about privatizing Social Security? Elimination of the minimum wage? Another tax cut for the wealthy? The possibilities are endless. The party of No, has got to GO! Vote out the obstructionists !